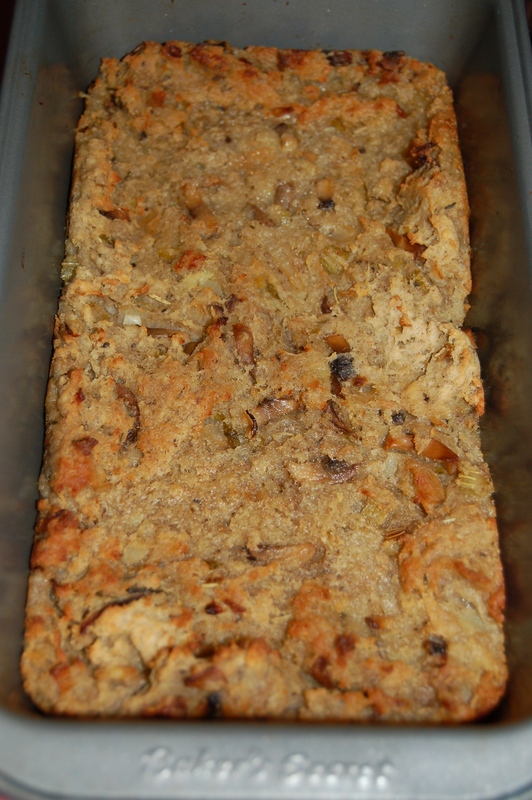 A Winning Irreverent Bread Stuffing (serves 12) | Crappy Kitchen - Good Dinners! Here we go again! 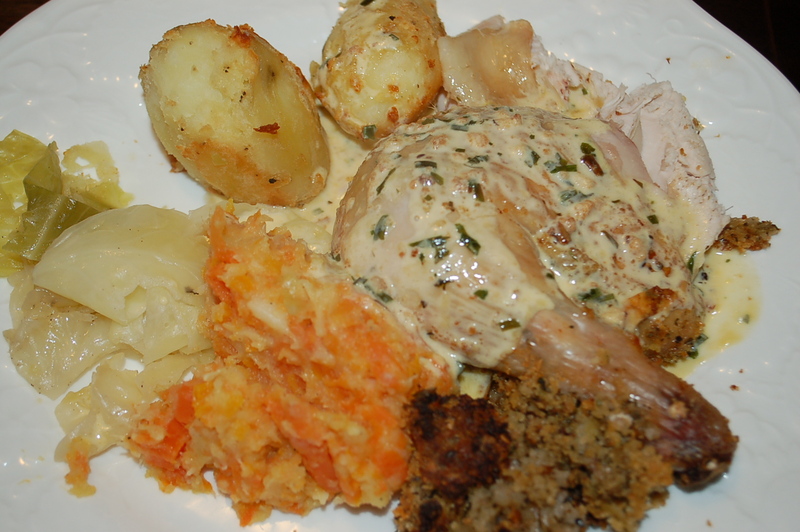 This Christmas was no different from any other in that the house was crowded with family and friends, there was mountains of delicious food and there was yet again another stab at reinventing my mother Maureen’s stuffing! 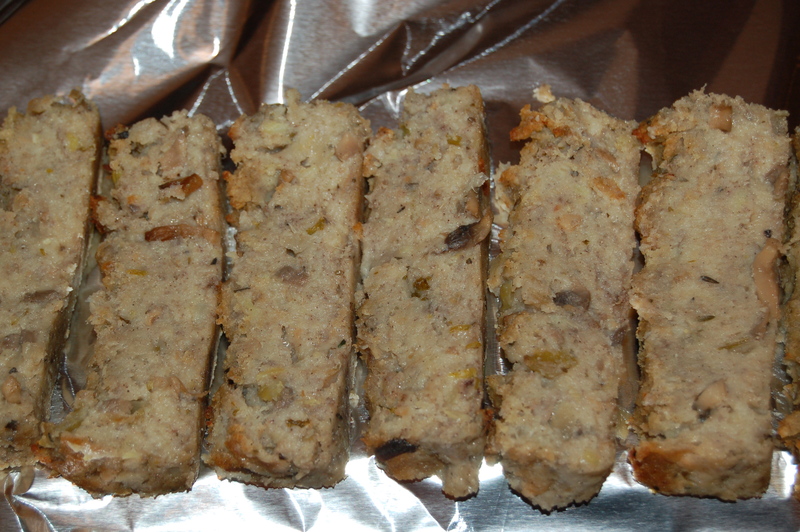 The bread stuffing was just one of the many dishes piled down the center of my Christmas table! When my mother was alive and well, I would call her to guide me through the steps, but even then, with her voice in my ear, I couldn’t get it right. It probably had something to do with the fact that when she made it, she didn’t think at all. She just threw it together as if guided by the cooking god inside her, and stopping to think about it and tell me what to do felt unnatural. My sister June makes a “Chicken Dinner” that my kids beg me to cook, but I cannot seem to manage that one either. I have watched her make it several times, but like all wonderful recipes, this one also comes from the heart and will only reach sublimity if she is the one at the helm, not me. On important annual occasions like Christmas there is a yearning inside of all of us to get a taste or whiff of the past. We want to experience the joy of being a child again, and eating a dish our mother’s made for us is a huge part of that feeling of comfort. (Remember Ratatouille!). My Christmas dinners are different from the ones of my childhood in that I like all sorts of people around the table, not just blood relatives. I like a big loud-gathered mishmosh of people. 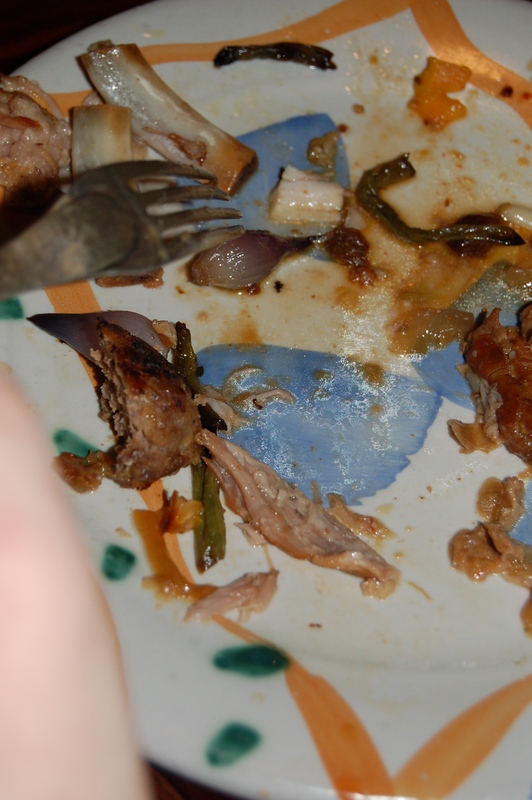 The food is always festive but varies from year to year depending my whims and whose around the table. 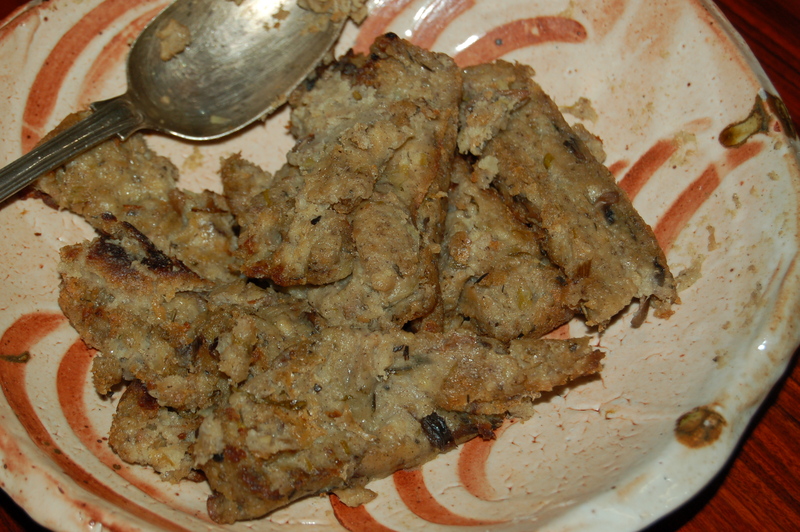 However there is ALWAYS a version of Maureen’s stuffing gracing the table. 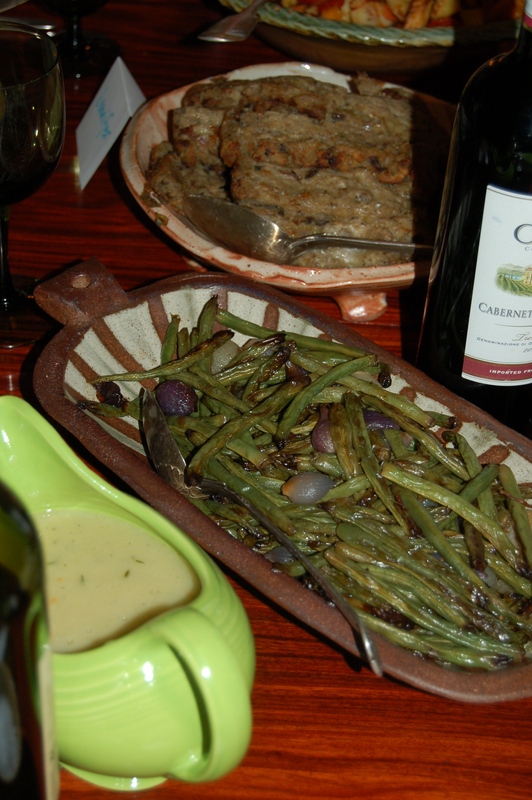 The meal would not feel like Christmas without it! This year I did something completely unorthodox and instead of using my mother’s mashed creamed potatoes as a binder I used white sweet potatoes; positively sinful! In every other way I did my best to conjure up her flavor but I decided on the sweet potato substitute out of curiosity, and also because I knew I was going to mess up the recipe anyway. It turned out pretty fantastic and was a big hit with everyone. I figure my new mission is to make a “version’ of my mother’s stuffing every year, that way, in years to come, my children will feel that got it right every time! 1 – Put large saute pan on low/medium and add two tablespoons of the oil. 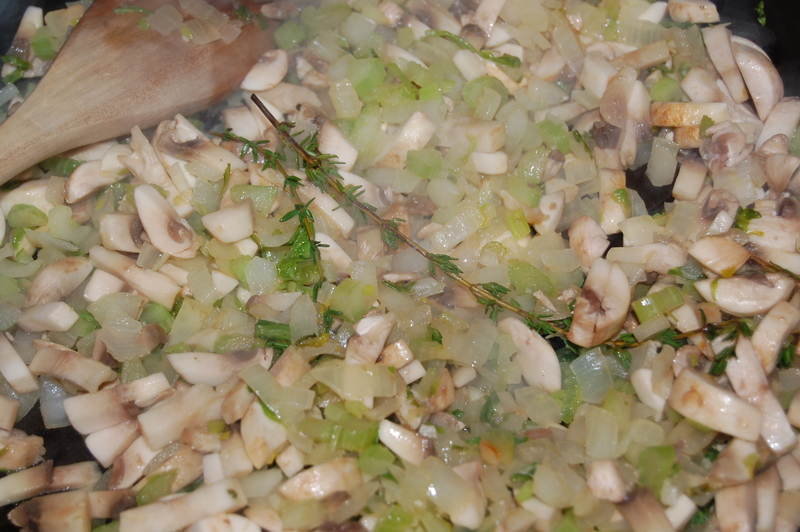 Add the onions, garlic and celery. Cook for about 5 minutes before adding the thyme springs and rosemary. 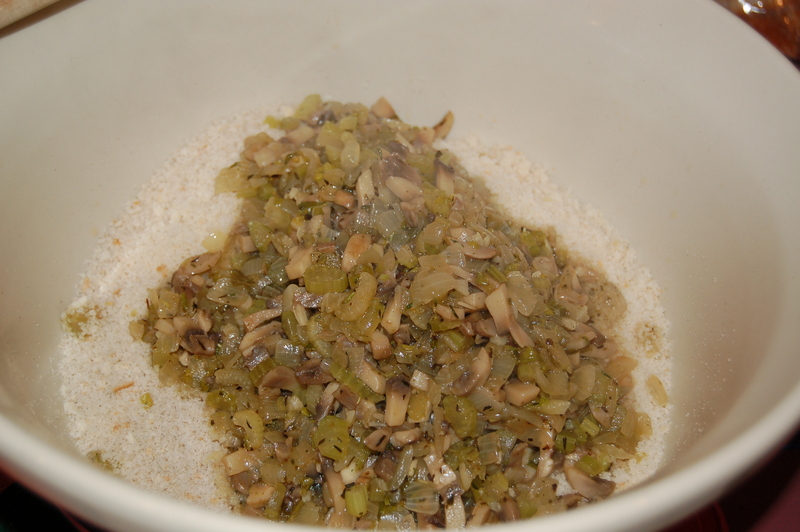 Add the diced mushrooms and turn up heat to full medium and cook for another 10 minutes, stirring occasionally. 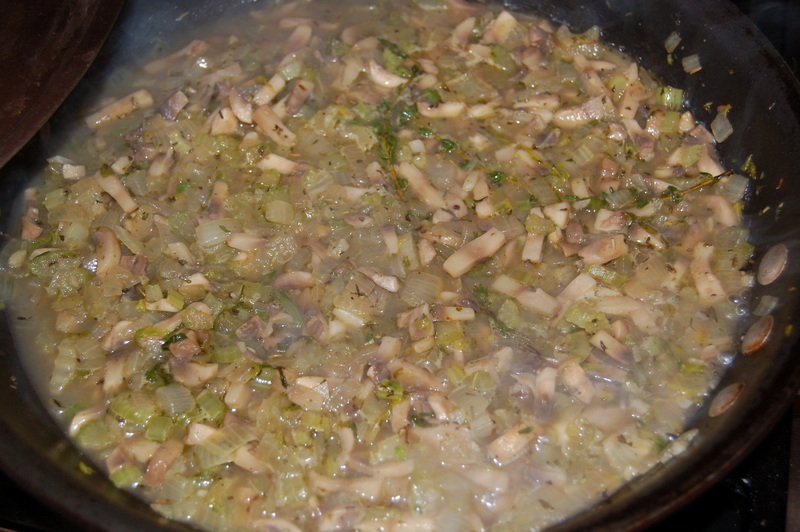 2 – Add the cup of broth and turn heat down to low. Cover and cook for another 5-8 or so minutes, until everything is nice and soft. turn off when done and set aside. 3 – In the meantime put the sweet potatoes into a pot and cover with cold water. Cover and boil until they are very soft (but not falling apart). 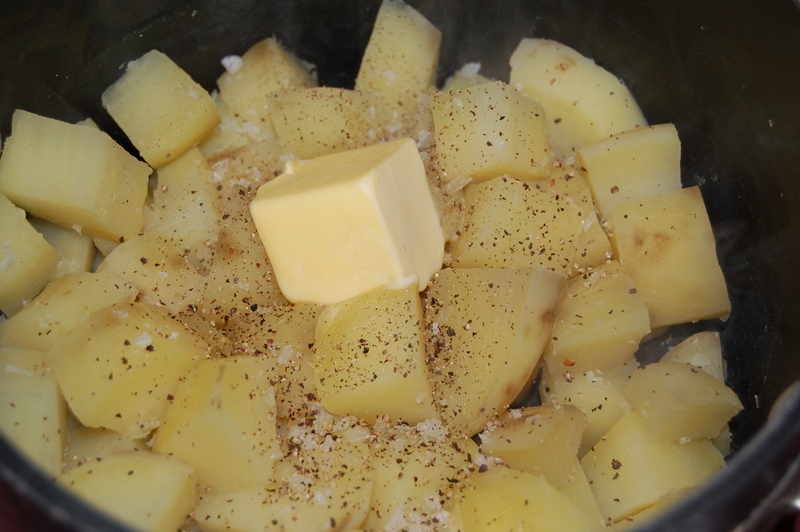 Drain the water and add the butter, salt, several grinds of pepper and milk. Mash until very smooth and lump-free. Taste and adjust seasoning according to your taste if necessary. 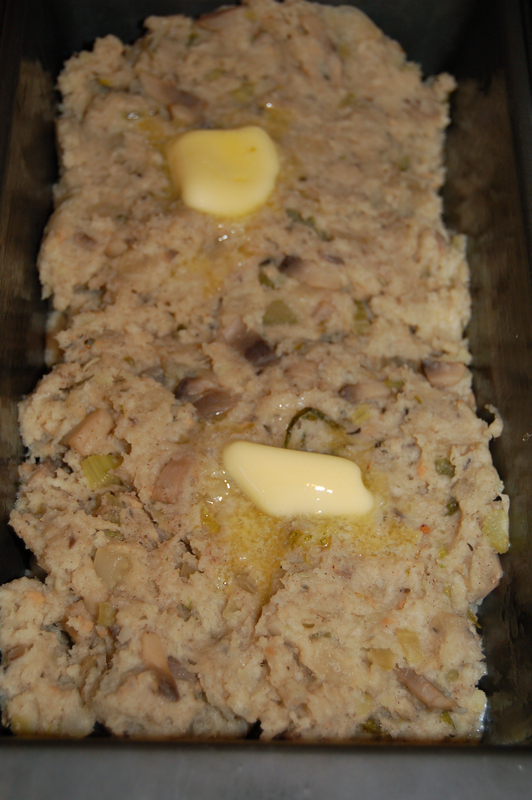 6 – Turn the mixture into two buttered loaf pan (or 1 larger loaf pan) and a couple of knobs of butter to the top. Cook in preheated oven for 45 minutes. Remove from oven and leave to cool for 5 minutes before turning out onto a board or work surface. 7 – At this point you can slice and serve or slice and place in foil and reheat before you are ready to serve. It keeps very well in the fridge for a week. It is great fried in the morning with an egg if you are lucky to have any leftovers, or as part of a sandwich. Barely remembered to take this picture before it disappeared! 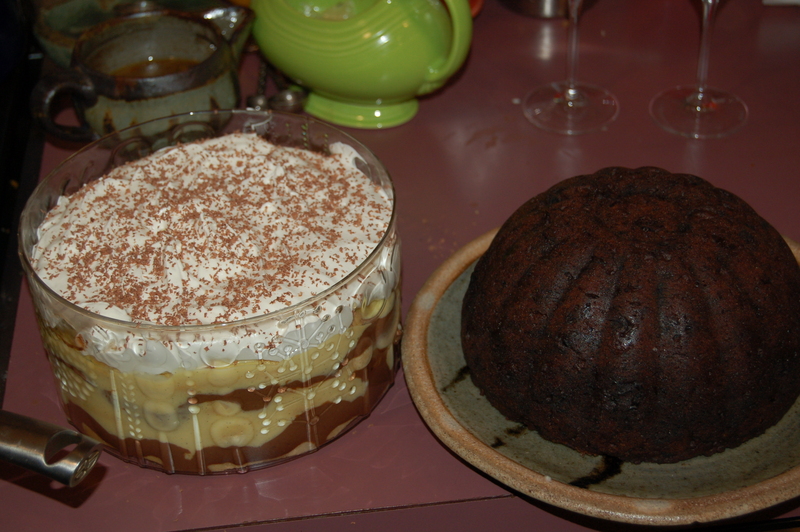 This entry was posted in dinners and tagged bread stuffing, christmas, Christmas dinner, christmas pudding, christmas stuffing, dinner with family, family & friends, holiday dinner, italian trifle, maureen's stuffing, stuffing. Bookmark the permalink. That Dinner looks soooo good! 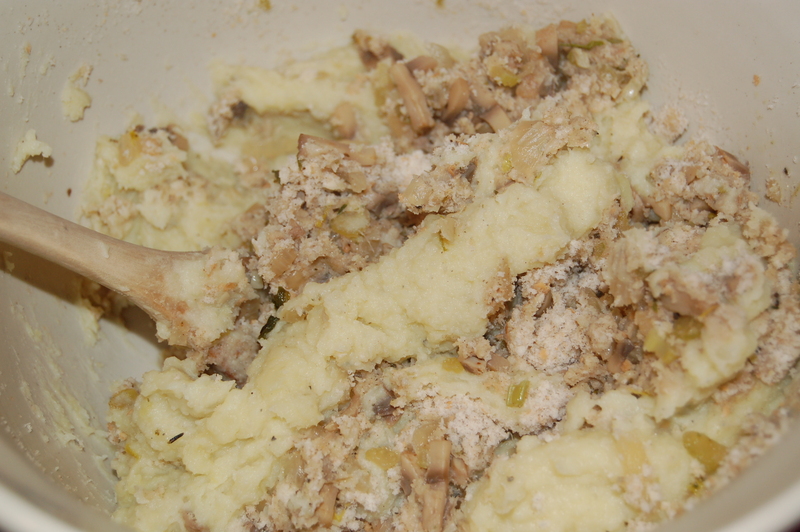 June made a totally different stuffing this year…I’m still not over it!